Dr. Mark Maertens, AirLife medical director, confers with nurses Gray and Parris. It’s 7 o’clock on an overcast May morning, and AirLife pilot Kevin Kyzer is checking the weather around the region served by the AirLife base at Swedish Medical Center in Englewood. The ceiling is low, and the clouds aren’t expected to lift much throughout the day. “It looks like a yellow day pretty much everywhere. We’ll be okay on the Front Range and out in the plains, but I don’t think we’ll be doing any mountain trips today,” he says. Parris answers in the affirmative, and then minutes later, comes bustling in the door with lattes and coffee for the crew. So begins another 12-hour day for the people of AirLife. 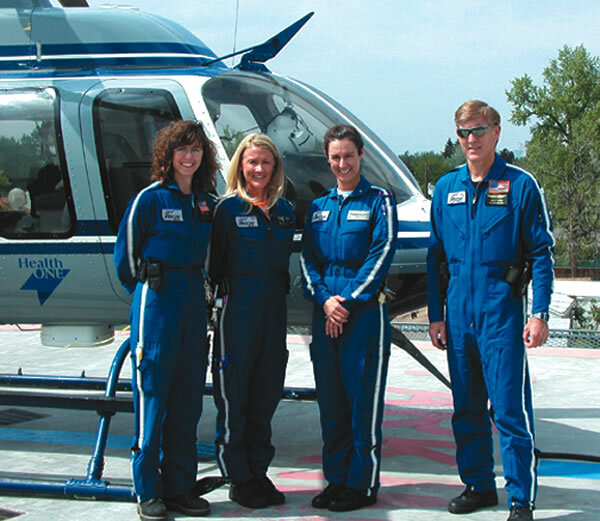 Operated by the HealthONE hospital system, AirLife provides emergency medical transport services to patients in a five-state region, including Colorado, Nebraska, Kansas, Wyoming and Montana. In addition to two Bell 407 helicopters provided by Air Methods, headquartered at Centennial Airport, AirLife operates a Learjet provided by International Jet, also at Centennial, and a specially designed ambulance for ground transport. As Gray and Parris inspect the medical equipment and supplies aboard the helicopter, EMT Larry Gahagan arrives. He’ll be driving the ambulance for the day, and Ahl will serve as the critical care transport nurse. Flight nurse Deb Hurlbut, who worked the night shift, emerges from the crew’s sleeping quarters, where she was napping. This will be a different kind of morning for everybody—it’s EMS Week, a national celebration of emergency workers, and HealthONE is sponsoring a Trivia Bowl at the city headquarters in Littleton. AirLife’s team, “Can You Hear Me Now?” made up of Parris, Hurlbut and flight nurse Karen Snider from the Aurora North base, will be competing against five other teams of emergency workers from local hospitals, ambulance companies and fire departments for the championship. After a rushed breakfast in the hospital cafeteria, the crew boards the helicopter for the quick flight to Littleton. Even though Kyzer is the pilot, he has help from the flight nurses who advise him of obstacles and potential problems on the ground. “There’s a communications tower right below us and power lines at 9 o’clock,” reports Gray, as Kyzer prepares to land. “Thanks, I see them,” he responds. Every trip they fly is a team effort, safety-wise. The Trivia Bowl is highly entertaining, even though the AirLife team is knocked out in the first round. The teams are competitive, but also supportive of their competitors. There’s lots of good-natured teasing, both about the teams’ answers and their costumes, which range from AirLife’s conservative and professional flight suits to a team of giant cocktails and a martini shaker. The questions mostly deal with medical knowledge, although a fair number cover the usual trivia topics. L to R: AirLife crew Beth Ahl, critical care transport nurse; Linda Gray, flight nurse; Missy Parris, chief flight nurse; and Kevin Kyzer, pilot. EMS Week culminates in the 5th Annual EMS Celebration and AirLife Memorial 5K/10K, a fundraiser for the Memorial Park located near the site of an AirLife crash in 1998. After the Trivia Bowl, the crew makes a quick refueling trip to the Aurora North base, and then returns to Swedish to wait for the next emergency call. Parris and Ahl work on charts while Gray counts and organizes supplies. “This job can be hours of boredom punctuated by 15 minutes of adrenaline,” he says. Finally, dispatch calls. A high-risk obstetrical patient in Glenwood Springs needs transport to Denver. After conferring with Gray and Parris, Kyzer decides to send the fixed-wing crew. The weather is still overcast, and he doesn’t feel that it would be safe enough to risk flying the helicopter through the mountains. While many of AirLife’s calls are to the scene of serious traumas, accidents or medical emergencies, a significant percentage of them involve transporting critical newborns or pregnant patients to Denver hospitals from outlying areas. For those trips, specialty teams—one neonatal team based at PSL, and a group of on-call obstetrical nurses—replace the regular flight nurses. To transport babies, the crew replaces the regular litter in the helicopter with an isolette. Like most of the pilots employed by Air Methods, Kyzer brings years of experience flying military helicopters to his job. And like the rest of the crew, he enjoys downtime the least. It has, however, taught him a valuable skill. “We have a seven-minute response requirement. I can go from a sound sleep to being up, dressed, alert and ready to fly in about five minutes,” he says. Another call comes in; this time it involves a construction accident. Kyzer sends the North team because they’re closer, and in the meantime, Ahl and Gahagan leave to transport a patient from one hospital to another in the ambulance. Parris and Gray, both finished with their paperwork, decide to lend a hand in the emergency room. “If we get everything else done, we come down here to see if anybody needs help. It helps us keep our skills sharp,” says Parris. The Swedish emergency room, a Level Two trauma center, is a beehive of activity, but many of the 32 beds are empty. It’s a slow Friday afternoon there, also. As they walk down the hallway, both pagers go off and the cell phones ring. Parris and Gray speed to the roof, where Kyzer is waiting in the ship, ready to take off. There’s been a motorcycle accident near Castle Rock with one serious injury. Less than a minute later, they receive the stand down call. The paramedics on the scene have decided that the patient is stable enough for a ground transport. The crew returns to the office. Those calls don’t happen often, but when they do, “they’re the worst,” says Gray. “You get pumped up and ready to go, and then you have to come down again,” he said. 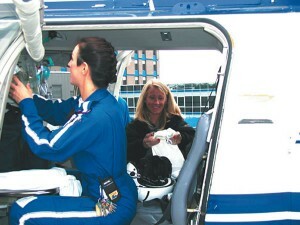 Flight nurses Missy Parris and Linda Gray check the medical supplies aboard the Air Methods Bell 407 helicopter. Gray has been a flight nurse with AirLife for six years, and spent five years before that as an emergency room and critical care nurse. She acknowledges that the job can be stressful, but says she copes with that by exercising. The crew also relies heavily on each other for support and stress relief. Each member of the crew rotates through both hospital bases; all of the nurses do a shift in the ground transport as well as in the air. That way, they all get to know and trust each other. And when it’s time to hire a new pilot or nurse, personality and temperament play almost as big a part in the hiring decision as background and skills. Parris, the chief flight nurse, is the newest member of the AirLife team. She joined them two months ago after spending 14 years as an EMT and 12 as an emergency/critical care nurse. She was a flight nurse for six years in Tennessee before taking the job in Denver. 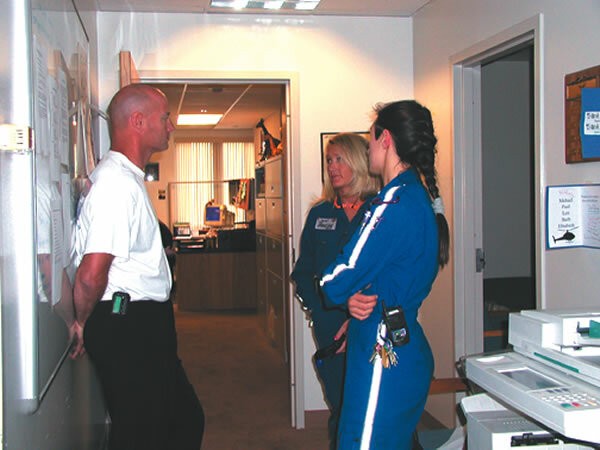 According to Dr. Mark Maertins, AirLife’s medical director, turnover on the medical staff isn’t a big issue. When people leave, it’s usually to further their medical careers, either through more education or by moving to a different position. As the afternoon wears on, the crew spends more time in the emergency room and helps the administrative staff deal with last minute details for the run and celebration on Sunday. Even though this has been one of the slow days, they know it won’t always be this way.